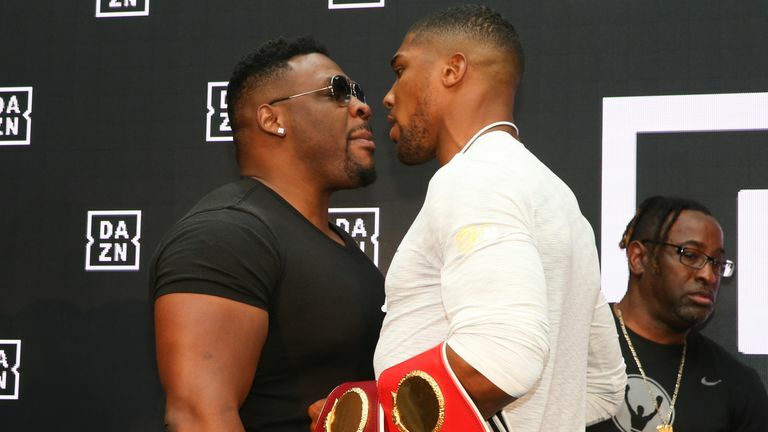 Jarrell 'Big Baby' Miller has fired a warning shot at potential heavyweight opponent Anthony Joshua, declaring: "I'm a monster, man!" Miller is one of several contenders to take on Joshua at Wembley Stadium on April 13, though an undisputed title fight against Deontay Wilder remains AJ's top target. Big Baby is in London for Dillian Whyte vs Derek Chisora, which is live on Sky Sports Box Office, and used his visit to call out IBF, WBA and WBO belt holder Joshua. He told Soccer AM: "He has something I want, and I'm coming for it. "I'm a monster, man. I heard he was a little nerd in school. He has about an inch and a half on me and I have about 50 pounds on him. " Asked whether he thought Joshua was the best heavyweight in the world, Miller scoffed: "Maybe in his apartment, but not in the world. Little different. "Of course I rate him highly, but I wear the pants in this game." Joshua and Miller were both in New York last weekend to witness Saul 'Canelo' Alvarez's knockout of Rocky Fielding, and the Brit suggested a fight with the American could be on the cards in the future. Miller said earlier this week he thinks a fight with Joshua has a "50-50" chance of happening, and has now urged him to "put his money where his mouth is". He said: "The first I heard about it was when he came to America over the weekend and said it at Madison Square Garden. "But I think it just sounds good. AJ is known for fibbing a lot, he changes his story up a lot here and there. So let's see if he puts his money where his mouth is. "Until then, I'll be ready to sock him in the mouth." Big Baby was more complimentary about Chisora, who is the underdog in his rematch against Whyte on Saturday. He previously said he wanted to "have a cup of tea" with Chisora, and is backing him to shock Whyte at The O2, saying: "The judges had Whyte as the winner of the first fight, but some people say Chisora won. It was a tough fight. "I think it's two top contenders going at it. They're real brawlers, not really technical fighters. "I think Chisora might be able to pull it off. Dillian Whyte looked a little bit scared in the face to face. "Chisora's been happy. His energy's been really great. I'm kind of rooting for Chisora in this fight." When are Whyte and Chisora on?